Brenna has decided she doesn’t want to hike anymore. After a little haggling I finally pull out the big guns: “It’s not a choice.” If I wasn’t sure she would actually enjoy it after a few minutes I would be more accommodating. Having an enjoyable time is the goal. We begin walking up the road toward a rocky knoll above the canyon. As expected, she’s quickly engrossed in a hundred things around us and grumbling is forgotten. Soon she has taken the lead and is calling me to come see this or that. 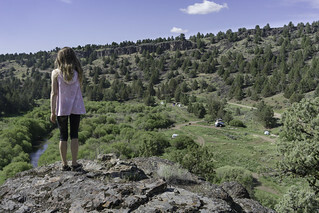 She walks ahead, out on a small outcrop overlooking the campground below. I pause and watch her stand alone, taking in the quintessential western landscape.